Sevanti Adventures is now taking active registration and payments for the 2018 tour. Registration is limited to 30 people. Secure your space soon. The 2018 Journey will begin in Kerala (south India) with the Sacred Sap Retreat, a week of rejuvenation at the Somatheeram Ayurveda Resort. Gentle daily yoga and de-stressing Ayurvedic treatments will ground us and awaken our senses to the beauty of India and ourselves. 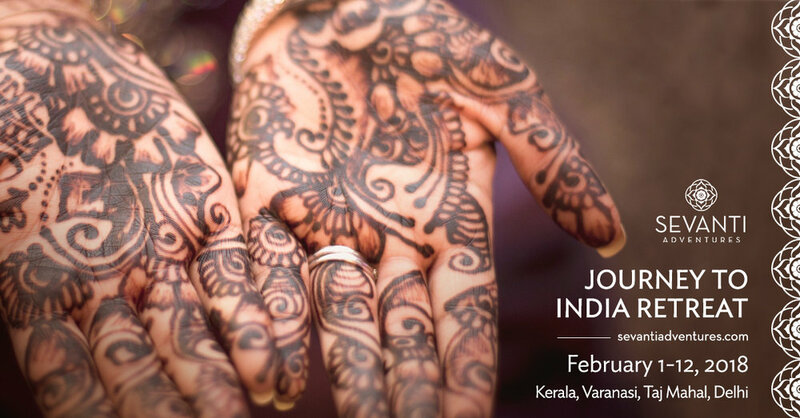 This is our time to ground, connect with our inner self as well as with the group, heal, recover from jet lag, nourish our bodies and souls, and experience the vast, vibrant beauty that is south India. Expect lots of lush tropical jungle, imagery that evokes Kiplings “The Jungle Book”, rejuvenating Ayurvedic warm oil massages, bathing rescued elephants in an Indian jungle lake, Ganesh ceremony in a Shiva temple, and a boat tour through the mystical backwaters of Kerala. This is our opportunity to slow down and reconnect with our most sattvic nature.